EVE (Embedded Video Engine) is a system combining features of QVGA/WQVGA graphic displays’ controller, resistance touch display controller and audio controller. Thanks to such configuration, development of any application with the use of a touch display is exceptionally simple, and the application itself, very cheap. 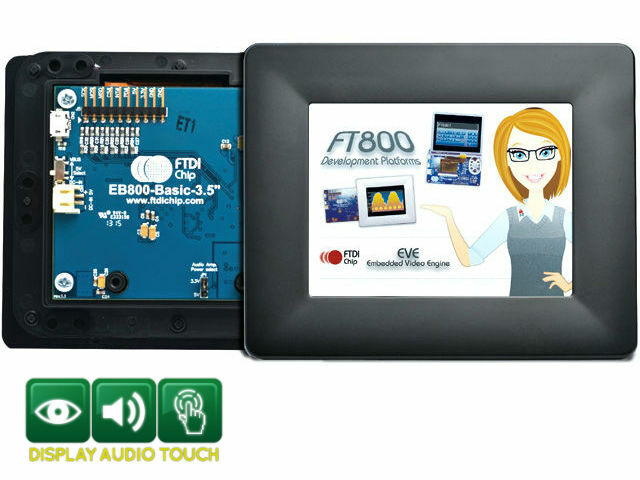 The whole activity connected with the operation of a touch display and a speaker is hardware supported which means that in order to develop a ready device, apart from the FT800 system, touch display and speaker, all we need is just a cheap microcontroller. Apart from that, the manufacturer offers ready modules with FT800 systems and 3,5”, 4,3”, 5” displays to be used directly in Embedded applications. The circuits can be used in building automation applications, medical equipment, public utility equipment (e.g. parking meters, automatic information service units) and many others.